Trend Talks: Should I Stay or Should I Go? Name: Trend Talks: Should I Stay or Should I Go? 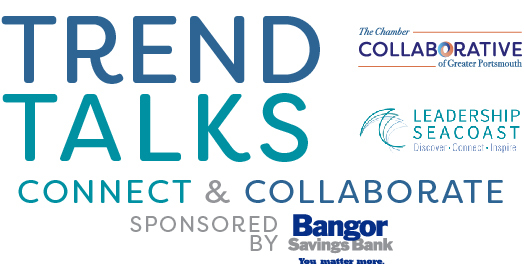 Young people in New Hampshire is the topic of the next Trend Talks, a cooperative program hosted by the Chamber Collaborative of Greater Portsmouth and Leadership Seacoast with sponsorship support from Bangor Savings Bank. The purpose of Trend Talks is to bring relevant and timely information to chamber members, Leadership Seacoast alumni, and the public around the core Leadership Seacoast topics of Health and Human Services, Criminal Justice, Economic Development, Education, Government, the Environment and Arts and Culture. A recent survey by Stay Work Play New Hampshire, a nonprofit committed to encouraging young people to stay in or come back to NH, looked at why residents choose to live in New Hampshire, evaluating their satisfaction and quality of life and determining whether they would stay in the state. At the Trend Talk, Will Stewart, Executive Director of Stay Work Play will discuss the survey, its results, and why it matters to employers and communities in the Seacoast. Sarah Garstka of Workforce Housing Coalition of the Greater Seacoast will address the topic of affordable housing, which is one of the top reasons why young people leave the area. Nathaniel Morneault of Catapult Seacoast will talk about how it offers professional and social opportunities for people ages 21 to 40. Lastly, we will hear from Stephanie Lucey, Chief People Officer with Bottomline Technologies to learn more about the company’s College Hire Development Program, a four-week training curriculum that provides the foundation necessary for young professional to thrive personally and professionally alongside their peers. Join us on August 14th as we dive into this issue that affects our Seacoast economy and communities. Questions of our panelists are encouraged. Can’t be there in person? Then join us on Facebook Live. Open to members of the community, Leadership Seacoast alumni, and Chamber Collaborative members.